chili & vinegar sauce, or ‘prik naam som’ is a primarily sour (but also spicy) condiment used to flavor noodles. Mash the garlic, chilies and salt in a stone mortar and pestle until a paste. Add the vinegar & sugar and mix well. Be *very* careful when you mash up the chilies, bits of chilies can fly out of the mortar and are very painful if the end up in your eye. I place one hand over the top of the mortar so that things hit my hand instead of flying out. You can store chili & vinegar sauce in the refrigerator for weeks, if not months. Ive tried this its really delicious.I really think it suits fish well. 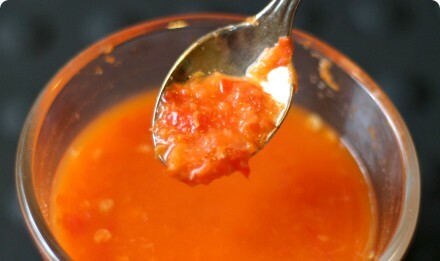 A great chilli sauce which is so easy to make. Thanks you have some nice recipes, but some more posts here for nam jim would be would be a great addition. nam jim talae and a recipe for pla neung manao or nam jim jaew for bbq pork. 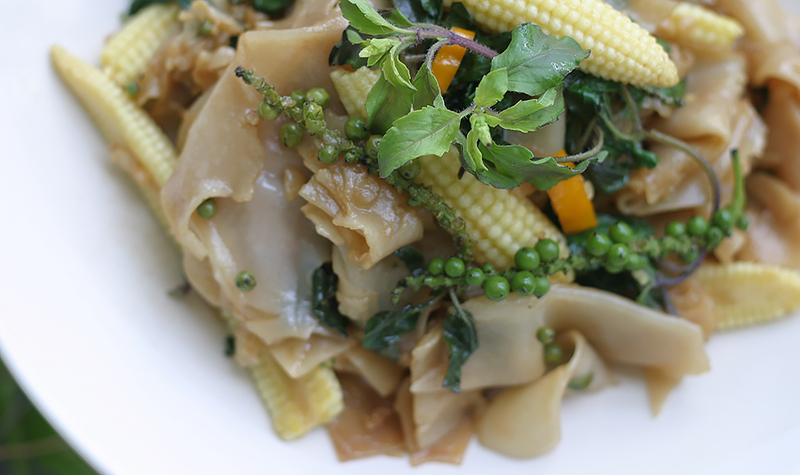 Even some recipes like nam prik num, nam prik ong and nam tok would be a great hit here.